“I don’t like either candidate, but at least X isn’t …” If there is a catch-all phrase for this national election season, than it is this. While we may argue the merits of each of the candidates like we argue for the flu in favor of pneumonia, no one feels good about casting their vote. As this election season winds up and a new President is elected, it is time to turn to the most important question—how can we avoid ever being in this situation again? Volumes have been written on our cultural demise and as many causes are assigned as there are authors. There is one particular cause that is worth examining, especially since it leads directly to a solution. The cause is the shift from what sociologist Susan Cain calls the Culture of Character to the Culture of Personality. The retirement of George Washington after two terms paved the way for the election of 1796. 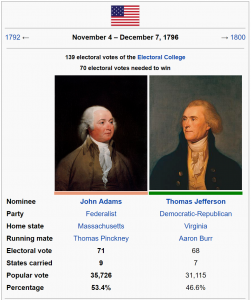 Two candidates emerged, John Adams and Thomas Jefferson. As surprising as it might seem, neither candidate actually campaigned. They were put forward by others (who may have campaigned on their behalf), but there was nothing like the organized campaign season we see today. Historian Joseph Ellis explains, “the very notion that a candidate should openly solicit votes violated the principled presumption that such behavior itself represented a confession of unworthiness for national office.” Despite the fact that not everyone had encountered Adams and Jefferson personally, their character was well known. In short, it was character that mattered more than personality. As some point during the early twentieth century there was a shift in emphasis from character to personality. A Culture of Character is one in which people value virtues such as honor, integrity, and modesty. The Culture of Personality, on the other hand, is one in which people are captivated by the impression one makes. It is this shift from the Culture of Character to the Culture of Personality that left us with such poor candidates. It goes without saying that both candidates were put forward for their personality and not for their character. We care more about their competency than we do their character. This is indicative of a larger cultural trend in which we worship celebrities and tear down heroes. In his Politics, Aristotle describes a fundamental attribute of democracy that can be either a blessing or a curse. The leaders come from the people themselves. Even if they are from a cultural elite like in our country, their character reflects and further solidifies the national character. When the people are virtuous, the leaders will be virtuous. When the people are filled with vice, the leaders will be as well. Recognizing this, St. John Paul II warned that “a democracy without values easily turns into open or thinly disguised totalitarianism.” Surely the Founders of our country knew this as well. John Adams’ insisted that “[O]ur Constitution was made only for a moral and religious people. It is wholly inadequate to the government of any other.” Adams thought that it required not only a moral (virtuous) people but also religious because virtue does not grow in an atheistic or wholly secular climate. A religious people believes that each human person will outlive the State, while a wholly secular people believes the State will outlive the individual. In other words, our beliefs about our destiny effect how we act. When Alexis de Tocqueville visited the United States, he noticed how the churches acted like a fourth wheel in the system of checks and balances. But he saw the Catholic Church as especially well-suited to our country: “I think that the Catholic religion has erroneously been regarded as the natural enemy of democracy. Among the various sects of Christians, Catholicism seems to me, on the contrary, to be one of the most favorable to equality of condition among men” (Democracy in America Book I Ch. 17). We can go even further and say it is not just the insistence of Catholics of the equal dignity of all men, but her corpus of Catholic social teaching that makes it important for her members to participate fully in society. We would be getting ahead of ourselves however if we were to justify the Church’s existence based on her political utility. The Church is not valuable to society because she promotes peace and justice, but because the Catholic faith is True. The Church is in the business of saving souls. She does this by preaching both who God is and who man is. As the Second Vatican Council document Gaudium et Spes says, the Church is a “sign and a safeguard of the transcendent character of the human person.” The Church and her members may serve in the political realm, but only as long as her members do not forget that the Church transcends the political. 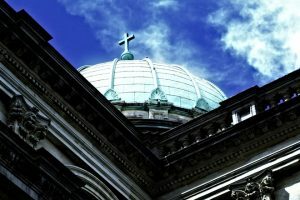 Why do Catholics represent the “last acceptable prejudice” in our country? Because like Israel of old, we have a mission to be a Light to the Nations. When we cease preaching the Gospel, God allows persecution so that we will be “forced” to preach the Gospel—a message not only about God, but also man’s exalted vocation. As Catholics, we have abdicated our role as custodians of the culture. Generations of Americans were formed by Catholic authors and Catholic artists. Classical music was almost always religious and usually liturgical. The early years of Hollywood was controlled by Catholics, so much so that both Pius XI and Pius XII wrote encyclicals on movies, radio and television to instruct Catholics on how to put this important aspect of American life at the service of the Truth. We complain and demonize “our culture” but we created the vacuum that allowed the demonic to enter. You cannot have culture, without cult so it is time we took it back. Pius XII also said that Catholics “should be second to none in their love of country.” In other words, the Pope was saying that Catholics should be the greatest of patriots. Patriotism is a natural extension of Our Lord’s commandment of love of neighbor. 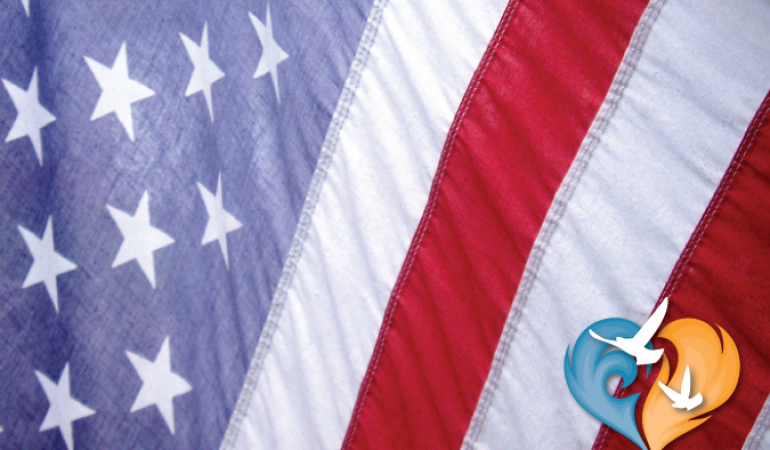 Patriotism is the concrete way in which we extend love of neighbor beyond our immediate family. If the family shows us the first step beyond self-love then Patriotism offers us the first step beyond our family selfishness. There is a tendency to look at all of the evils that our country tolerates and develop, if not a hatred for our country, a severe indifference. But when we compare it analogously to our love of family, it becomes clearer how patriotism works. We love our family, not primarily because of its greatness, but because it is ours. We may see the faults of its members or even the ways it is dysfunctional, but we still love it and strive to make it approach the ideal. Likewise it is with love of country. We love our country not because it is great but because it is ours. We can still love it despite all the evil it tolerates without loving those evils. We can “hate the sin, but love the sinner.” We can look at the sins of our country, even those of the founding, and still love it. We can repent of them knowing that we failed to live up to the standards of the Gospel and the principles of the founding. One of the best ways to fight our present social woes is to form the virtue of patriotism—one would not want to see the country they love betray its foundational principles. One would not want to see the blood that has been spilled to protect those principles be in vain. It is precisely because we love our country and its national principles that we can see evils like state-supported abortion for what they are and for what they do to our country. Rather than growing discouraged, we fight those evils because we love our fellow countrymen, especially the ones in the womb. We must jealously guard our fellow countrymen from falling into these evils the way we would a family member—because we love them. One final point. The bulk of the responsibility for extending the Gospel into the political realm lies with the laity and not the clergy. Even if Bishops and Priests are derelict in their duty to help form the laity, this does not absolve the laity from their obligation of spreading the Gospel. Our country is in the state it is not because of some failure on the part of the US Bishops, but because of the abdication of the Catholic laity. Bravo Rob this is spot on. If we are to Transform our culture and our country we first need to Transform ourselves, become the light on the hill and demonstrate the beauty and truth of our Cathloic faith for America to witness.